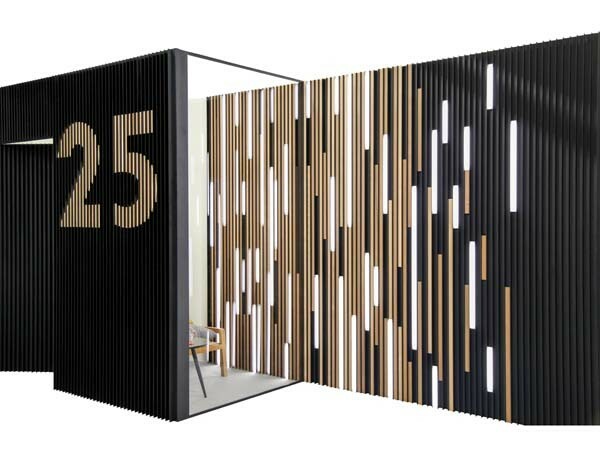 Renson presents a vertical wall cladding range that can be personalised with different types of vertical blades and a wide range of accessories to create eye-catching designs for the home. Vertical wall cladding can deliver the clean and pure look in home design sought by many architects and clients. Renson already has Linius blades for horizontal aluminium wall cladding in its product range, but the different types of vertical blades that can be combined with matching insets help create endless possibilities for innovative and creative designs. Vertical or horizontal, regardless of the wall cladding you choose, the profiles click fast and securely on the universal horizontal supports. One can create unique designs using different types of ‘Block’ and ‘Even’ blades, which can also be combined with each other. Accessories ranging from LED strips to decorative elements in wood, aluminium and other materials are available for the finishing touch. The sleek and stylish Block blades use individual profiles for flexible applications breadthwise. The Block modules can be arranged in such a way that certain gaps are not so wide while others appear to be wider. A variety of patterns can also be created depending on the depth of the gap or the height of the blocks. Additionally, Block blades can be decorated with LED, wooden and aluminium modules that can be clicked between the blades according to the design. Available in four lengths, 300, 600, 900 and 1200 mm, the LED modules can be used to personalise a facade just like the wooden insets. Ideal for a minimalist execution of an aluminium wall cladding, Even blades can be used alongside insets with LED lighting, wood and aluminium. All these inset modules have the same width and depth, allowing endless combinations to be integrated in the blade wall design. The LED modules are also available in four lengths (300, 600, 900 and 1200 mm). The excellent finish produced with ‘Block’ and ‘Even’ aluminium wall cladding makes this solution ideal for exterior facades as well as interior walls, especially when integrating the two spaces seamlessly. To produce a uniform design without interruptions, the same wall covering can also be used to clad garage doors and other openings, making them practically invisible on the facade.